My backyard bay laurel tree is two feet tall, and it is slowly dying. (Okay, maybe I contributed to its slow demise by picking off too many leaves….) So I was happy to see big bunches of bay leaves for sale at the farmers’ market for the bargain price of $1.00. I bought a whole bunch, and I plan to pick the leaves off of the branches and store them in the freezer to preserve their just-picked odor. Meanwhile, I’ll start looking for a new, slightly larger tree to replace my fading sapling. 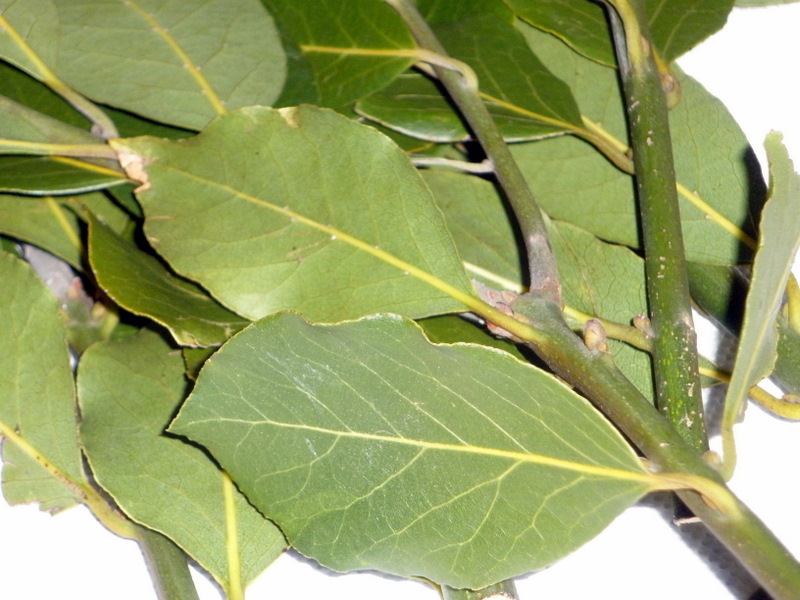 Fresh bay leaves are intensely aromatic, full of a sweet, camphor-like, almost ethereal scent. and the bay laurel (laurus nobilis), is widely grown in south Lousiana, though it is native to the Mediterranean region. The ancient Greeks and Romans used bay laurel wreaths to crown the victorious in athletic competitions (including the ancient Olympics), military campaigns, and literary festivals (hence the modern term “poet laureate”), favoring it as a symbol of the god Apollo. According to legend, Eros shot Apollo with an arrow of gold, while he struck the nymph Daphne with a leaden arrow, in retribution for Apollo’s making fun of his archery skills. The lead arrow sent Daphne, in hatred, running from the amorous Apollo. She called out to her father, the river god Peneus, who saved her by turning her into a bay laurel tree. Apollo tended the tree, proclaiming that its branches would crown heroes and its leaves would never fade. Some modern cooks don’t appreciate the aroma of bay–probably because they’ve only used the sad, dried-out, wan leaves sold in glass jars at the supermarket. Admittedly, I’m partial to bay–I like any herb or spice I can find locally grown. The still-green leaves are wonderful stuffed inside a roasting chicken, or torn into strips and braised with potatoes and onions. Even if you don’t cook, a branch’s worth of bay leaves will perfume your kitchen with a fresh, natural, savory scent. Where did you have the bay leaf panna cotta? At Incanto in San Francisco. Clearly, I have not mastered the skill of the Reply button. Sorry. I have one of these which is about 3 ft tall also. Should I pick the leaves and let them dry some or just pick the leaves as I need them and throw right into the pot? Now, since I half-killed my little tree, I’m no expert. I just picked the fresh leaves as I needed them, BUT I recently read that you shouldn’t pick any leaves off of a smallish tree (one source said no picking for at least three years). I transported my bay laurel tree in a large pot from California to New Orleans, and it flourished. (Unfortunately, when we moved to Arizona it was too large to transport and I left it with a neighbor, who reports that it died in the aftermath of Katrina.) However, so many “authorities” directed that one must always dry the bay leaves before using them that I used to pick off the branches and dry the leaves for use. Now you’re saying that they are just fine to use while fresh and green? I did have a replacement tree here for a few months but it did not survive the Arizona summer. There must be a way; I need to give this another try. Oh yeah: fresh and green is the way to go…dried is nice, but the aroma is much stronger when fresh. Freezing the leaves, rather than drying, helps to preserve the just-picked scent. Sorry to hear that your laurel didn’t make it; if anyone can get it to grow in the desert, it’s you…how are your chickens? Chickens are laying. Three hens produce more than we can use. We get one brown egg, one green and one blue, but not always all three in one day. We have heard that some species are hardier in the heat of summer so we need to do a little research before we get more. Meanwhile, we are eating lettuce and arugula from the garden, and other plants are progressing nicely. It has been a mild winter. I wish I could trade for eggs with you! Our winter was especially harsh–cold and wet–this year. I think my kaffir lime tree is dead, though I’m waiting a few more weeks before I chop it down. There is a leaf blight that can kill Bay Laurel quickly- it is caused by a fungus. I agree that key truly is not to over water and leave it alone for at least 5 years when it is very small. I have had great success with that also- but if it is blight- then that is a different matter. On citrus, I have been advised to wait until April 1st to see if the freeze has truly done in the frozen tree.. and to wait until after March 30th for frost free planting… Thanks for the bread recipe, It looks delicious and I can’t wait to try it! Thanks for the info on the blight…I wish I could blame my tree’s poor condition on a fungus. Unfortunately, I just tried to pick its leaves as though it were a basil plant! than maybe you can tell me where I can buy some of these leaves. Thanks so much and you can contact me by e-mail and let me know. Big-box stores w/garden centers often don’t have a wide selection of trees. Also try calling your county agricultural extension agent–he/she can point you in the direction of local nurseries specializing in edible plants/trees. Good luck!